I must have an iGo so I can charge up my phone when my kids or the kids I have with us run down my battery watching You Tube episodes of their favorite shows to keep them busy when we are at restaurants. When the phone no longer works - chaos ensues lol! The adapter I'd be game for would be the Blue Ant OR even better the Kodak digital camera adapter. I'll be contacting you shortly to find out which adapter you want! I know you'll love yours as much as I love mine! 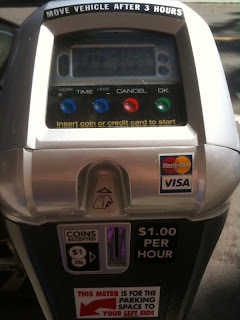 Even Parking Meters Have Joined the 21st Century! Yesterday, my husband and I took the boys to downtown Laguna Beach for some shopping and lounging at the beach. It was a gorgeous day and we obviously weren't the only ones with the idea to hang out at the beach because finding a parking spot took a while. Once we found street parking, we did the usual scrounging around for coins. I popped out of the car to load up the parking meter and couldn't believe what I saw... all parking meters in Laguna now accept Visa/Mastercards! Um, wow. I didn't think anyone would believe me so I snapped the picture above as proof. Anyone else see the parking meters of the 21st Century? I'd love to know where else you can find them! Tuesday 3/30/10- Family Fun Night 5:30- 8:30pm. Cost is $9 per kid, $4 per adult. Adult supervision is required. You can also buy pizza by the slice ($2 each) with free lemonade and snacks. Wednesday 3/31/10 - Toddler Time 10:30 am-12:00 pm. $7 per child, and that includes admission for one adult (additional adults are $2 each). Thursday 4/1/10 - Toddler Time 10:30 am- 12:00 pm. $7 per child (includes one adult), additional adult $2 each. Toddler passes are available for $60 and it includes 10 visits. Thursday 4/1/10 - All Ages Open Play 5:15pm - 7:15 pm. Cost is $8 per child and includes entry for 1 adult. Adult supervision is required. Be sure to bring socks! For more information check out their website here. Time for Earth Hour - Will you be participating? 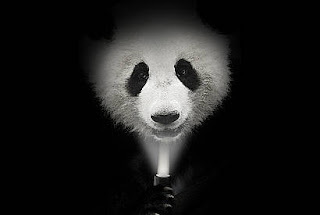 In case you hadn't heard it's time again for Earth Hour, sponsored by WWF. 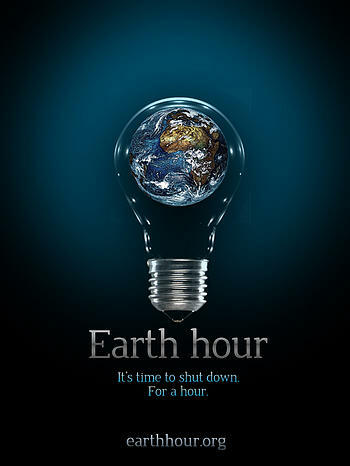 Since 2007, every year millions of people across the world take 60 minutes out of their evenings to completely shut off the power to make a statement in support of the Earth. You'll see famous landmarks like the Golden Gate Bridge, Eiffel Tower, the Sphinx, Empire State Building and Victoria Falls going dark for one hour. Last year an estimated 1 billion people participated (including our family!). Here in California, it will be at 8:30 pm tonight (Saturday March 27th, 2010). Will you be participating? *Images above are courteous of the WWF website and used on here strictly to promote Earth Hour. Eyes Lips Face - Awesome Make-up for Fabulous Yet Frugal Friday! 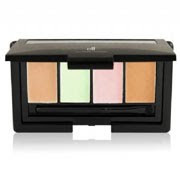 Another edition of Fabulous Yet Frugal Friday... Make-Up Time!!! A couple weeks ago I co-hosted an Eyes Lips Face (E.L.F.) Make-up at home party with Day Tripping Mom. ELF generously gave us a ton of make-up to play around with. Oh my gosh, I am in love with their products now! I must admit only a couple months ago I had never heard of the company, but now I'm hooked. I've been an avid MAC cosmetics girl for over a decade due to my insanely sensitive skin (I seem to be allergic to just about all skin products... just betting it's the fragrances). I'm just not that open to playing around with new make-ups since there is a pretty good chance I will be allergic to them! So the opportunity to play around the products without having to buy them was an opportunity I was not about to miss! ELF products are like a hidden secret because they don't do a lot of the heavy marketing we are accustomed to from cosmetic companies. ELF also relies on its (aggressive & successful) social media strategy to gain new customers. It won't take long if you take a peek at their website to get the itch to pull out your credit card and buy some. When someone told me how much the items cost, I seriously said "Yeah Right!" but was more than pleasantly surprised... I was FLOORED when I saw for myself. The average price is between $1.00 - $3.00 each item. And no, that is not a typo! The high end product is the AWESOME minerals line. And remember, high end cost at ELF is $3.00/each. I have never used the more expensive Minerals line make-ups before (again, I'm just not in to spending a gazillion bucks on something just to find out I'm allergic to it... been there... done that. *ahem* Coco Chanel). 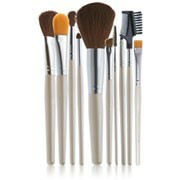 For $20 you can buy the entire set (including brushes). 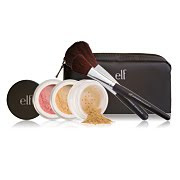 If you become a fan of ELF on Facebook you will be the first to hear about exclusive deals ranging from deep discounts (Yeah, as if the products aren't a steal already!) to free shipping codes. Also be sure to follow them on Twitter. My husband is pleasantly surprised at the dramatic decrease in my spending on make-up. Anyone know how I can get a license to drive one? As I sit here watching the US House of Representatives pass the historic Health Care reform bill, I can't help but be flooded with memories of a time over a decade ago when my Mother made a fateful choice - that she just couldn't afford health care insurance. She had stopped smoking 6 years before, but even then the insurance rates were just too high for a single Mother to afford for herself, so she chose to go without. For months she had ignored the symptoms, afraid of the medical costs. By the time she went to the doctor her Lung Cancer was very advanced and she was fighting for her life, literally days from death, warned her doctors. We brought her back from the edge, but her medical bills were astronomical. She'd done the right thing, she'd quit smoking years before, but still she faced a losing battle with Advanced Lung Cancer. I know I've eluded to the loss of my mother before in posts, for those that know me personally, you know how special she was to me and how much even now, more than 12 years later, I miss her as if I lost her yesterday. I find it hard to share much about the experience with people because really, it was a beautiful experience and that is hard to explain that to people. I was given a gift that most daughters don't have... I was able to dedicate 11 months of my life to taking care of her, what feels like a drop in the bucket compared to what she did for me over 19 years. She's indirectly the main reason why I started this blog. Being a Mom is one of the most wonderful things in the world and the loss of my Mother strengthens my passion to inspire other Moms to appreciate the little moments with their children. So as I sit watching the votes come in, I can't help but hope this is what is right for the country and that it will give people access to healthcare that otherwise wouldn't have. And no, I'm not really weighing in on either "side" because I'm an Independent, and have been for years. (I don't fall in to either the Republican or Democrat categories, I actually never have.) I'm just a busy working wife and Mom of two that hasn't had time to research this bill, all I can do is sit back and hope that it helps other Mothers not face the tough choice my Mother faced years ago. Whichever side you're on, let's all just work together to make it work instead of being caught up in who wins. 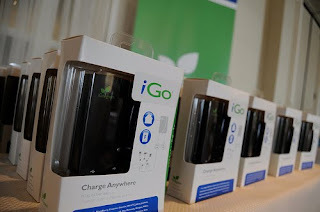 A couple of weeks ago I attended the Silicon Valley Moms Blog LA event and I got to take home an iGo charger. I had no idea how much I would fall in love with this! It's not just a cell phone charger, it's a rechargeable battery! It's so simple, yet a HUGE lifesaver if you use your cell phone as much as I do. Here's what I do... I use it as a charger overnight to recharge my iPhone, but at the same time it is recharging the battery pack. In the morning I throw the iGo in my purse and it's ready to boost my iPhone back up where ever I am (even while on a ride at Disneyland!). I've actually had to start hiding my iGo from my husband so he doesn't snag it from me. (Yes, I'm planning on buying one for him for Father's Day, and I can safely say that on here because he doesn't read my posts! Shhhh!) He recently went on a short business trip and admitted he almost bought one at the airport. He'd spent the entire flight playing iPhone game apps and had used up his battery. He had to wait to call me until he got to the car and was able to plug in to the car charger because he was at 2% of battery life. So you're probably thinking, that's great and all... but what about those who don't have an iPhone? Well, they've thought of everything! The iGo is designed to have an adapter which makes it able to work with most phones and other electronic devices. And in true OCMomActivities style... I'm THRILLED to announce I'm giving an iGo away to one lucky reader!!!! The rules: One lucky reader will be chosen at random using random.org. The giveaway will end April 2nd, 2010 at midnight Pacific time. You must first do the mandatory first entry, but be sure to make an additional comment for each additional entry you make. Only residents of the contiguous 48 states may enter (sorry Canadians, Hawaiians & Alaskans!). If you don't leave your email address in the comment, be sure I have a way to reach you if you are the winner (i.e. Twitter, etc.). If I'm not able to reach you within a reasonable amount of time... I will have to draw another winner. 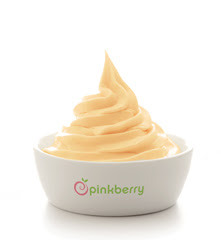 Fabulous Yet Frugal Friday - Free Pinkberry! To celebrate the arrival of their newest flavor... Mango, all Pinkberry locations are hosting Mad About Mango Happy Hour Friday (March 12) from 5-9 pm! Just for being there, you will receive a FREE 3 oz cup (with tons of toppings)! In case you don't have it already programmed in to your navigation system... click here to find where you closest Pinkberry location is. Enjoy! I wanted to let everyone know why my posting has been a bit haphazard lately... apparently my back is trying to betray me. (Note: I said trying, not succeeding.) I've been having horrible sciatic nerve issues. I'm crossing my fingers that it subsides soon here and I can get back to my normal posting because I have a ton of great posts to get written and out to you (including several AWESOME giveaways!). The only other time I have dealt with sciatic nerve issues was during my pregnancies with the boys! If you happen to know any helpful tips on how to improve my sciatic nerve issue (that unfortunately is complicated by being stuck sitting in front of the computer for 8 hours a day at work), please share or email me! I've been icing it and have put all my high heels deep in to the back of my closet for the time being. Also, if you haven't email subscribed yet for the posts head on over to the upper right hand corner of the page to do that, just be sure to respond the verification email you'll receive. I always find it easier when the posts of my favorite blogs appear in my email inbox so I can read the posts whenever I have a few minutes. If you tend to spend time on Facebook, be sure to become a fan because I add the new posts up there too. Bare Escentuals Lip Gloss Winner! 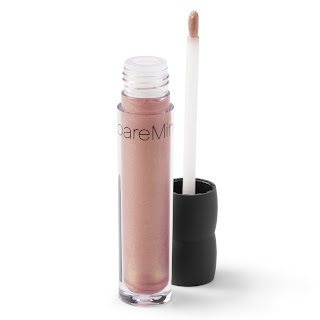 Using Random.org I picked (& notified) a winner for the Bare Escentuals Lip Gloss.